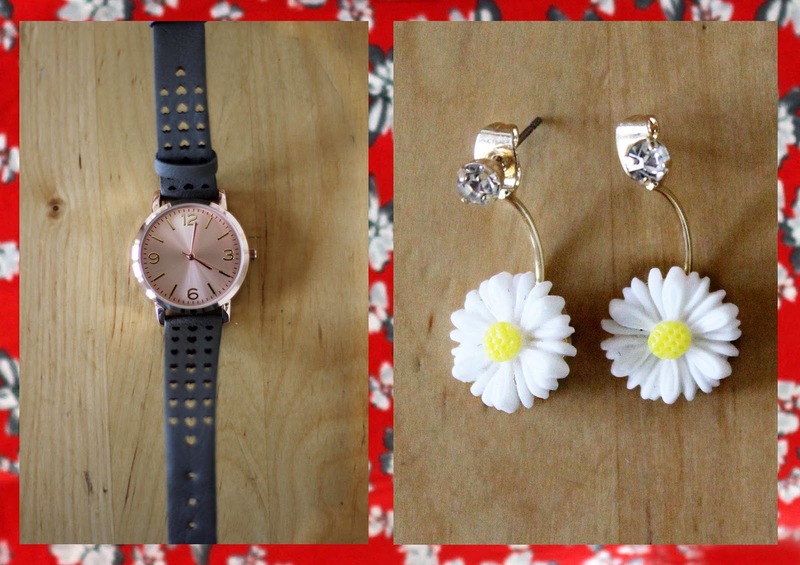 As we have just entered spring and it feels like summer is creeping around the corner, I thought I'd create a bit of a floral themed post to brighten up my blog. I've created this post in collaboration with George at Asda, who kindly let me select a few pieces for my spring wardrobe. I've gone for a look which I think would be perfect for a lovely and warm summery date night. I love going for dinner and drinks by the river in Kingston. I wanted to channel my inner Kelly Brook (I mean who doesn't?) so I popped on these black peep toe heels from New look to tie it all together. I also think these black loafers from Asda give the outfit a more casual twist and therefore a great thing to throw on for a BBQ or picnic with your closest girlfriends. Picnics are one of my favourite things to do as the weather brightens up, see my post all about one of my favourite days whilst living at university for example. I picked out this watch with a rose gold face and grey strap, bound to be a hit with bloggers as is anything with an element of copper/rose gold, another great way to add something to your outfit to make it a little more special. If any of you are interested in buying this dress or any other items from Asda, I would highly recommend popping down to your local shop beforehand, as the sizing is very generous. I’m wearing a 10 in these photos but I could have easily worn a 6 or 8 and some of my other pieces I picked are just far too big, I looked like I was wearing someone else clothes! Let me know what you think of this outfit, how would have you worn this dress? I was surprised at how much of a selection there was & it's so affordable too! Thank you. You should see if you can get your hands on them, they're only £3 I think! First off you look gorgeous in that dress! And second that dress is so beautiful, the pattern the color! 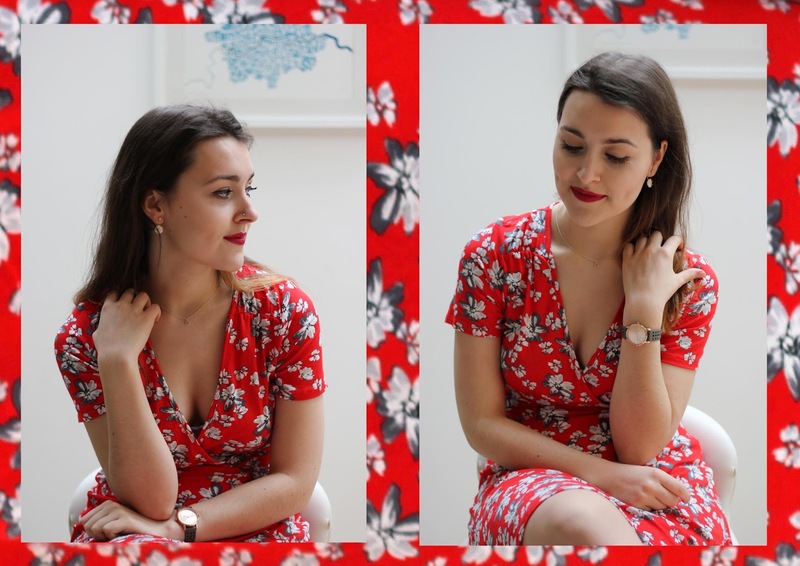 I love the colour too, I think I'm going to add more red into my wardrobe after putting this post together! You look SOO classy!!! I love it! Thanks for letting me know how you found my blog, it's always so interesting for me to hear! The dress is so beautiful! It looks very comfortable, but still chic (right up my alley!). I wish I could get my hands on something similar, but there are no Asdas in Canada... I suppose I might get lucky and find a dupe! Thank you for putting me in a spring-y mood! It is super comfortable! You're luck to live in America, you have Sephora & access to Lauren Conrad's collection at Kohls! This dress looks soooo lovely with the red lipstick! I love this dress! The pieces you picked to go with it are lovely as well! Love the rose gold on that watch! Thank you! I love rose gold detail on watches too.